How stinkin' cute is this new stamp and die set from Reverse Confetti?!?! I figure with my DH being a Police Sergeant, I will get a lot of use with this new collection. Now that I have made one of these donuts, I doubt I will decorate them any other way. How adorable is the white Flower Soft used for the icing? As you can see, I adapted the sentiment to fit into Christmas. 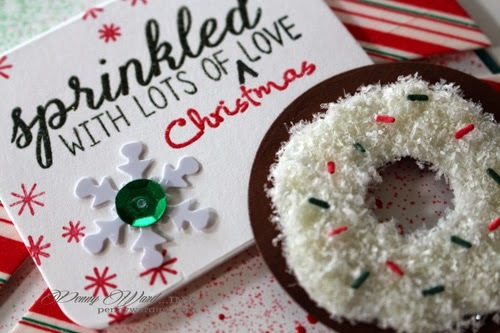 Using this method, you could make this "donut" for any holiday! This is fantastic - so festive! The Flower Soft is the perfect donut icing! Thanks for joining us at Sketch for You to Try! The creative section of your brain must be ENORMOUS! This is over the stop adorable!! Makes me hungry.